Each July, Camp Alphaville descends on London, an eclectic finance conference discussing topics ranging from macroeconomics to fintech to the music industry. It also provides a focal point for the Twitter finance community to meet in real life, where conversations are not confined to 140 characters at a time. This year it was renamed the FT Festival of Finance, a reflection of how the audience has grown considerably over the years. As ever, the speaker list was full of well known figures from the finance industry and related sectors. With multiple streams going on at the same time, it was impossible to see all the talks and panels, but in general I tried to attend the talks which were more focused on the the macroeconomic environment. In this note, I give a few of my takeaways from the event. The first presentation of the day by Peter Praet, Chief Economist at the ECB, gave a speech on “Transmission channels of monetary policy in the current environment” (link to full text). He began by noting that there were two transmission mechanisms, the first being how monetary policy was linked to financial market conditions and secondly how financial market conditions were linked to spending decisions. Essentially, banks could be seen as bridging the future with the present. He also discussed the challenges of negative rates and that a persistence of negative rates would be damaging for banks. On Brexit, he observed that there wasn’t a liquidity shock following the vote. At the same time, whilst it was important not to rush to conclusions, the biggest impact was the uncertainty. It was important that that there was an orderly process for Brexit and to have a road map for it. The following Brexit panel was chaired by Katie Martin from fastFT, discussed would be both the possible repercussions for the market and also the likely scenarios, we could see. Steve Keen, head of economics, Kingston University, suggested that we had seen the “death of neoliberalism” following the vote. From the political perspective, Alex White, The Economist Intelligence unit, spoke about how for 25 years politics was very much a game of the centre, without a huge difference between left and right. In terms of the economic impact of the vote, the assessment of Toby Nangle, Columbia Threadneedle, was that it had an immediate impact on the UK economy and it was difficult to see investment today in this scenario. Mike Amey, PIMCO, viewed Brexit as a UK centred event. More broadly, he noted how globalisation had increased growth whilst reducing inflation. Gilt yields have collapsed post Brexit, he added. At the same time, he felt that they wouldn’t go negative and attributed a very low chance of the Bank of England moving the official rate into negative territory. On the possibility of a deal with the EU, White noted how deals always look difficult in Europe, but that Europe had a strong incentive to a deal with the UK which was balanced. He also felt that Article 50 wouldn’t be pressed immediately. Richard Woolnough, M&G, took a different position, expect a messier divorce between EU and UK. Martin also asked about whether austerity had impacted the vote. Nangle noted that the majority of people in work voted Remain, whilst White chimed in to say some might have felt they had very little to lose from a leave vote. Whilst, the tone of panel could hardly be termed as upbeat, it was perhaps not as pessimistic as I would have expected. Later in the day, Gavyn Davies, from Fulcrum Asset Management and Tyler Cowen, from George Mason University, also discussed Brexit, with moderators Izabella Kaminska and Chris Giles from the FT. Whilst, both Davies and Cowen were for the Remain camp, there was a distinct difference in their post-referendum approach. Davis stressed that whilst it wasn’t the decision he had hoped for, the decision had been voted upon and must be accepted. At the same time, precisely how the UK engages with the EU is still a matter which needs to be addressed and was up for grabs. Indeed, commentators have suggested that there many types of arrangements that the UK could have with the EU could be anywhere from a Norway style EEA agreement, which would also full access to the single market, to associate membership or even a hard exit type scenario. Tyler’s outlook was that it wasn’t the case that the UK had to invoke Article 50. Chris Giles also took a straw poll from the audience, asking how many of us were postponing spending decisions in light the Brexit vote. Quite a few hands shot up! Whilst, this is by no means the most scientific of polls, it nevertheless illustrates that uncertainty is never a great catalyst for economic growth. The topic of Brexit also came up during Lionel Barber, FT, interview of Mikhail Khodorkovsky, Open Russia Movement. Barber asked whether Putin would be happy with Brexit. Khodorkovsky suggested that Putin would not be upset at what has happened in UK. The rest of the interview centered around Khodorkovsky’s relationship with Putin and also his thoughts about the future of Russia. Flow data can be very rich sources of information for those wanting to understand foreign exchange markets. Despite this, I do get the feeling that this area is neglected within currency research, simply because the data can be difficult to understand, and is somewhat more fiddly to work with than other sorts of data. Matt Klein from FT Alphaville interviewed Hyun Song Shin, Economic Advisor and Head of Research, BIS, with the discussion focusing on the issue of cross border financial flows. Song Shin gave an analogy of how to view a bank’s balance sheet. He suggested to view it like a building, with foundations essentially equity, whilst the height can be considered as debt. When there’s rapid growth he suggested, whilst the foundations may remain the same, the height (debt) expands rapidly and debt itself is a function of macroeconomic conditions. Fluctuations in the balance sheet will show up as capital flows. As with Praet, Song Shin discussed the unintended consequences of negative rates. In a simple model, there was nothing special about “zero” rates. But this simple model ignored banks. When rates go negative, banks are unable to pass this cost on to deposits, at the same time it is transmitted to borrowers. During normal times, it might be possible to ignore banks, but not in the current scenario. He noted that tracking gross flows will give you more information than simply examining net flows, given that gross flows will reflect leverage. Hence, if the balance sheet is very large, it is suggestive of risk taking. He also drew a contrast between leverage in housing versus that of banking. If we look at leverage over the cycle for an individual owning a house, as house prices rise, their leverage goes down (given that their mortgage remains the same). By contrast in banks, leverage is procyclical. He also discussed the USD more broadly and its relationship with risk taking. He suggested that a rising USD acted a factor that depressed risk taking. Indeed, when regressing the cross currency basis against VIX, USD and FX vol, it was possible to see that the USD has a major impact. More broadly, we can see the impact on USD on cross border lending. When USD is weak, there is more cross border lending in USD. However, when it is strong, balance sheets shrink. Song Shin, suggested that EUR was also beginning to behave in a similar way, taking on the status of an international funding currency. As EUR weakens, there is more more borrowing of EUR by foreigners. The subject of central banks was raised by Klein, he asked whether they have run out of ammo at this point? Song Shin gave a mixed message on this. Whilst things were not as dire as in 2008, with for example the employment situation being not far off historical averages, there were at present very high levels of debt coupled with low productivity levels. Furthermore, there was lack of manoeuvre from monetary policy and we may at this point be at a lower bound. As in previous years, the conference was thought provoking. In general, there did seem to be consensus, that Brexit would not be an easy path, with uncertainty, but the precise outcome of what an agreement would look like is still “up for grabs”. In these uncertain times, no one really has the answers (to use a cliche which I’m sure will be even more cliched in the months and years of Brexit uncertainty ahead). However, with a bit of discussion, maybe, just maybe, we can find these answers! 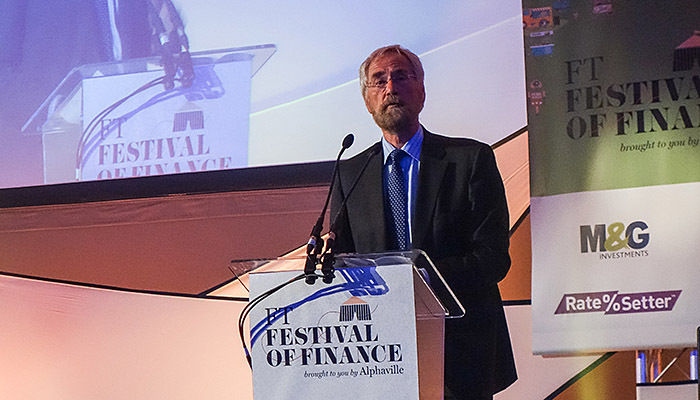 I hope to back at the FT Festival of Finance next July. You also view all my photos from the event here.